Anti-piracy outfit Web Sheriff has found itself mired in controversy after asking a music metadata site to change information relating to the artist Taio Cruz. After asking for proof that Cruz's birth name is not Adetayo Ayowale Onile-Ere as listed, MusicBrainz received a birth certificate from Web Sheriff. However, it's being claimed that the document is a forgery. When an anti-piracy company gets involved in issues that don’t include the protection of copyright, things always feel a little unusual. In this case, however, things have progressed well beyond that. The story begins back in September 2015 when music meta-data site MusicBrainz received a rather unusual demand from (in)famous anti-piracy company Web Sheriff. 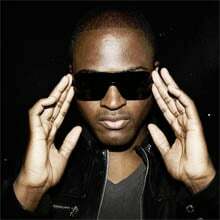 Instead of the baseless legal threats the site often receives when anti-piracy companies confuse it for a pirate site, Web Sheriff asked MusicBrainz to “correct” some data on its artist page for Taio Cruz, specifically his name. The page lists three names for the artist including Taio Cruz, Jacob Milan Taio Cruz and a less familiar one, Adetayo Ayowale Onile-Ere. While unusual to Western ears, Cruz has a Nigerian father, a fact celebrated in depth on various Nigerian discussion forums over the years. Indeed, references to Adetayo Ayowale Onile-Ere can be found on webpages dating back eight years and is variously claimed to have been Cruz’s name at birth. However, according to the Web Sheriff, that is simply not true. In correspondence seen by TorrentFreak, last year Web Sheriff informed MusicBrainz that it protects the online rights of Cruz including his “on-line security”. The company claimed that a news reporter had erroneously reported Cruz’s name as Adetayo Ayowale Onile Ere “some time ago” and the “error” had gained traction online. Entries on Wikipedia only made matters worse, Web Sheriff said. Noting that they had been hired to correct all online references to the “bogus name”, Web Sheriff told MusicBrainz that the issue is causing Taio Cruz “unnecessary anxiety” so a “correction” would be appreciated. In principle MusicBrainz founder Robert Kaye agreed, but requested proof of Cruz’s real name. “If you can provide us with some legal proof that [the name is false], we’ll consider making this change,” Kaye said in a return mail. Some two weeks later in October 2015, Kaye received more correspondence from Web Sheriff, this time with a copy of a birth certificate said to belong to Cruz. 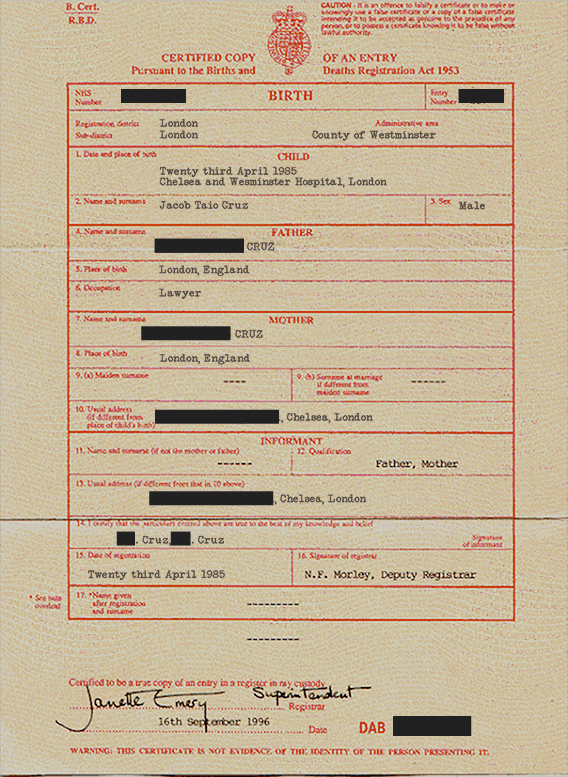 However, Kaye was not convinced of the authenticity of the document, noting that although Cruz’s father is often reported to have been a lawyer, that term is not usually used in the UK. “With this observation as my motivation, I rang up her majesty’s government to ask how I would go about verifying the validity of a birth certificate. I was told that the UK government could not verify the authenticity of a certificate, but that I could request a copy of the certificate myself since they are public record,” Kaye explains. Then the bombshell. On November 8, 2015, Kaye received a letter from the government informing him that a certificate with the details he supplied simply does not exist and that his processing payment would be refunded. Indeed, at least on the surface there does appear to be problems with the document, not least the spelling error in “Chelsea and Wes(t)minster Hospital” and the fact that the National Health Service reports the hospital as opening in 1993, eight years after Cruz was born. All this leads to the MusicBrainz founder concluding that Web Sheriff sent him a fake and/or falsified birth certificate for a world-famous recording artist. “This means that Web Sheriff provided us a forged birth certificate in order to accomplish its dirty deeds,” Kaye says. Intrigued, TorrentFreak contacted Web Sheriff who told us that they acted in good faith. “For your info, the relevant Birth Certificate was provided to us by the client / principal concerned. We have absolutely no reason to question its veracity (MusicBrainz’s comments notwithstanding),” the company said. In all fairness MusicBrainz didn’t accuse Web Sheriff of forgery, only of passing a forged document on, but if the certificate is a fake, one has to wonder what the motivation behind it is. Is it a case of genuinely wanting to correct the facts and making a mess of it? Or is there something more sinister at play? In any event, faking a UK birth certificate is a criminal offense so Streisand Effect not withstanding, it better have been worth it.